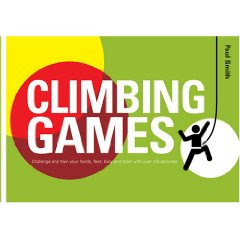 "...This is a real bumper fun book with over 120 different activities described and although there are some who will say many of the games and activities have been around for a few years, it is really nice to see all the ideas on the one volume. Especially at the price of under a tenner! The icons on page 7 give a clear induction of what each activity will improve and as you progress through the book these become familiar and easily remembered. 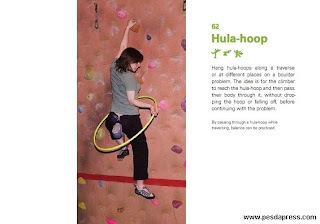 There are brief notes on the safety issues including spotting, wearing helmets indoors, supervising novice belayers before moving on to look at the fundamental skills such as balance, body awareness, handholds and footholds etc. Many of the earlier activities described are those that we traditionalist would simple have called a ‘warm up’ however we are warned not to call it that now as certain groups may associated the term with schools days…..ah well, I will try but some habits are difficult to change after all these years! 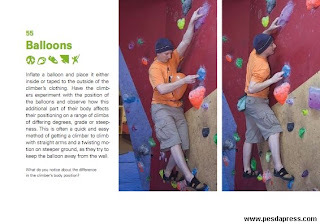 The book progresses from these ‘loosening up’ activities to take a specific look at Traversing, Balance and Footwork before the last two chapters look at un roped climbing activities more suited to the bouldering wall before finishing of with activities which will help the budding leader adapt to clipping quickdraws as they contemplate the transition from seconding or top roping to leading. 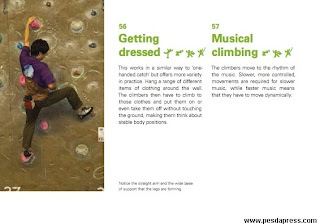 The book relies on colour photographs with just a short paragraph to outline each activity and this is to me this is perfectly adequate, perhaps this has something to do with the clear layout that we have come to expect from Pesda Press. All in all it is difficult to find anything to criticize about this little book, especially considering the cost and should be a must for everyone involved in working with novices, particularly in the indoor environment where it can often be difficult to keep younger kids enthused over longer period of time".